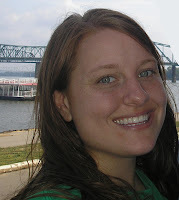 Amber Leasure-Earnhardt’s last day as the Huff Run Assistant Coordinator at Rural Action will be July 31. She has served previously at Huff Run as a VISTA member in 2007-2008. The year before that, Amber participated in AmeriCorps State in Iowa maintaining trails in public parks and can tell stories about living in a tent for six months! Amber has contributed greatly to the work of Huff Run during her time there. Amber has worked tirelessly on annual Awareness Day field trips, the Environmental Explorers Club, Huff Run fair displays, many many classroom presentations and her now famously elaborate window displays. 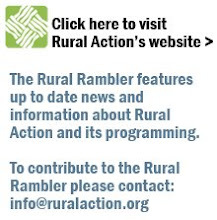 Amber expanded Huff Run’s occasional Ag Mailing to farmers into an Agricultural Newsletter and has reached new stakeholders through community events such as the Ice Cream Social (which coincided with Mineral City’s longest power outage in years) and Huff Run’s Elected Officials Tour. Amber has gone beyond her call of duty and stayed longer than others could. Huff Run has benefited greatly from Amber's talents, joy and enthusiasm. She will be sorely missed. In early August, Amber will be moving to closer to RA HQ to Athens so that her husband, Eric, can attend Ohio University to obtain his graduate degree and eventual PhD in American Literature. Amber will be working as an on-site manager at her new apartment complex but is also looking for a job in the Athens area in her chosen fields of environmental and political sciences. We wish you all the best, Amber! Thanks Amber! You've done a great job increasing watershed awareness in Huff Run. I wish you the best of luck in Athens.